Quest Text: Willy is challenging you to catch a squid. 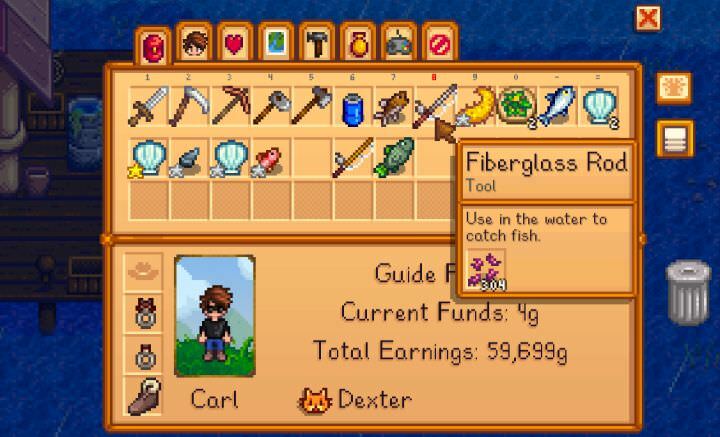 He says you can fish them from the ocean on winter nights. Requirements: Bring Willy a Squid. Since the game is fairly detailed, involving many life-like roles, a number of players lose their direction in the beginning. To help the players pass through different quests, there is a series of short guides that you can use to accomplish the mission and save a lot of your time. This brief step by step guide describes how to complete ‘catch a squid’ story quest, and when does it turn up on the game. For this quest to trigger off, you will have to make it to the winter season. The second day of the season will rise with a letter from Willy, vehemently demanding you to catch a squid. 1. 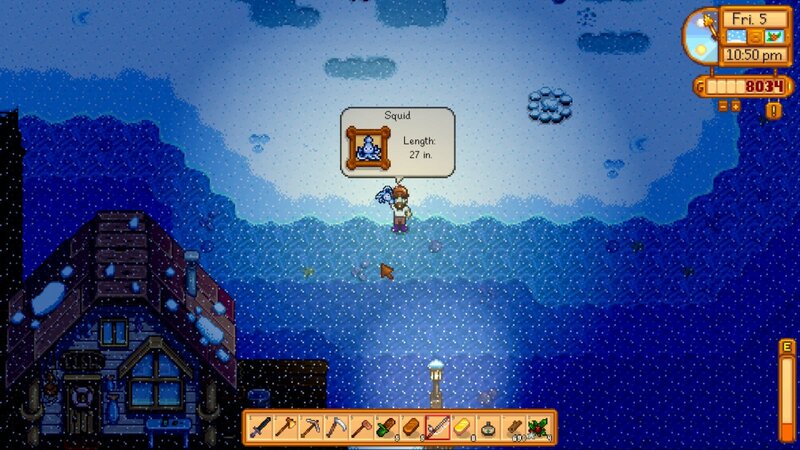 There is only one area where you can catch the squids. And that is down on the beach closer to Willy’s shack. Furthermore, the squids can be caught (a) in winter and (b) they can only be caught at night. 2. This means that you will only have 28 days in a year to complete the quest, and no longer than a few hours each day. 3. Squids happen to be sly creatures, and even if one is on your hook, it can take multiple tries to land a squid. To make this smoother, it is a better idea to have some levels of training in fishing. Additionally, you should also get some practice in fibreglass rod as well as some bait. Acquiring these levels and better gear will make the quest a little easier to handle. 4. To catch the Squids, wait for the lights to go out. This will happen around 7 pm to 8 pm. 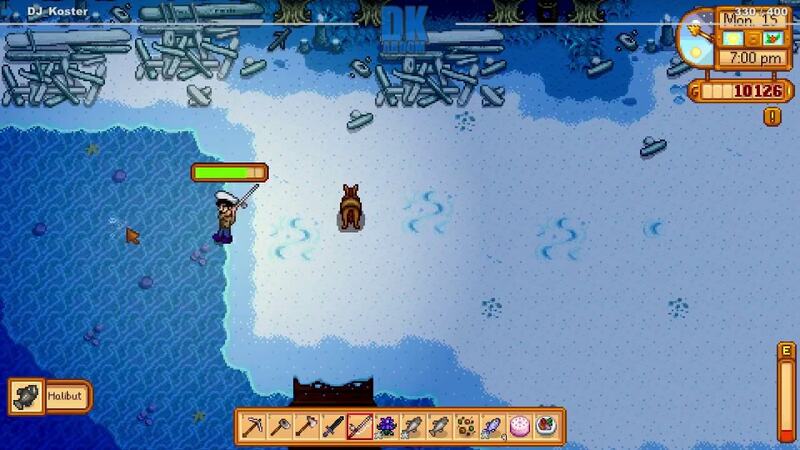 Once this happens, head down to docks near Willy’s store and then start fishing. 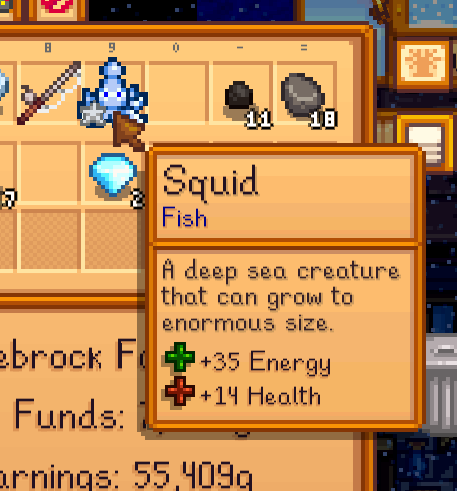 Keep fishing until you finally catch a squid. 5. Also, remember that you will pass out at 2 am so make sure to keep checking the time. Because if you pass out, you will wake up next to your bed the other day and you will also have a bill from Joja Corporation. So to avoid all this, head home as soon as the clock turns to 1 am so you will have plenty of time to reach home before you pass out. 6. 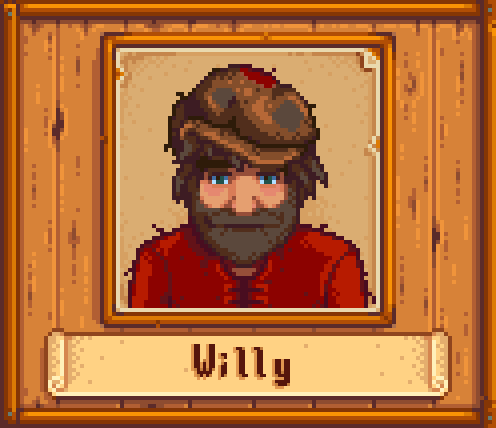 Once you have caught a squid, bring it to Willy. But remember that he often comes home very late in the night, so if you have fished off his dock, better rush to him before he goes to bed. This whole quest can be very tiring if you don’t find the Squid on the first try. But, the good news is that your efforts won’t go without a reward. When you give Willy his squid, the man will give you a whopping 800 gold in reward that you will receive via your Journal.